Welcome to the weird, action-packed world of PLASMA, a new science-fantasy adventure from producers Jason Hite and Brock DeShane. Imagine the human farms of The Martrix done with stop motion and you'll get the picture. PLASMA has its origins in a stop-motion short made by Hite in 2005. Titled STASIS, the film traveled to numerous festivals, including Slamdance, Monsterpalooza and Comic-Con. 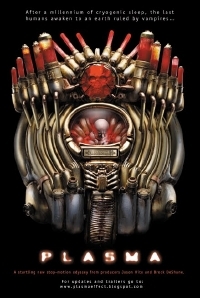 In the process, it won awards, produced a comic book spin-off, and garnered the attention of Clive Barker and Filmthreat.com, who found it â€œreminiscent of METROPOLIS and H.R. Giger.â€ All along, Jason continued to sketch new characters, create stop-motion puppets, and script new scenarios based on the short. PLASMA explores a future Earth ruled by biomechanical vampires. Awakened from a thousand years of cryogenic sleep, the last man and woman search for each other across an ocean of blood, and in the ancient ruins of the world they once knew. Along the way, they must face a legion of hell-spawned monsters in a quest to save their loveâ€¦ and the human race. Follow the production on the film's blog. Sounds awesome can't wait to get home and check it out.